Toronto (February 8, 2018) – McDonald’s finds itself driving traffic to the nearest restaurant location with the new Follow the Arches campaign. The iconic arches have been deconstructed and transformed into directional billboards, meant to give consumers a nudge in the right direction. “The campaign is a playful example of how the arches are recognizable, even when the consumer only sees a portion of the logo,” said Andrew Mumford, McDonald’s Regional Marketing Supervisor. 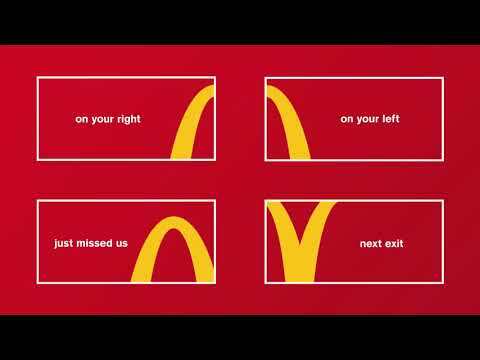 The campaign features sections of the golden arches logo as the only graphic element, paired with a simple instructional line, allowing them to work anywhere in the world with any language and be immediately recognizable as the brand. “We noticed that all over Canada, from major cities to small towns, you could find signs directing you to the nearest McDonald’s. This campaign is a nod to those signs, but with a fun visual twist. With minimal text and a creative use of the brand’s colours and logo, Follow the Arches not only translates on a national, but a global scale,” noted Peter Ignazi, Chief Creative Officer at Cossette. The out-of-home campaign will consist of four billboards (three static and one digital) in high traffic areas across downtown Toronto and the GTA, targeting people on the go who might just need a little reminder that the next McDonald’s is just a left or right turn away. In 1967, Canadians welcomed the first McDonald's restaurant to Richmond, British Columbia. Today, McDonald's Restaurants of Canada Limited has become part of the Canadian fabric, serving close to three million guests every day.